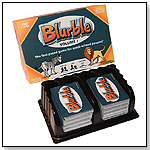 Blurble is a hilarious, fast-paced card game that is great for nearly all ages and group sizes. Flip over a card and be the first to say a word that starts with the same letter as the image on the card. Proper nouns, numbers, and words with fewer than three letters are not allowed. The winner of each card moves on to challenge another player, and the player with the most cards at the end is the winner. 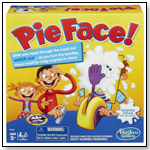 Aside from the hilarious gameplay, Blurble is also a great educational tool for children.